Dimensions 0 by 7 by 9.12 in. 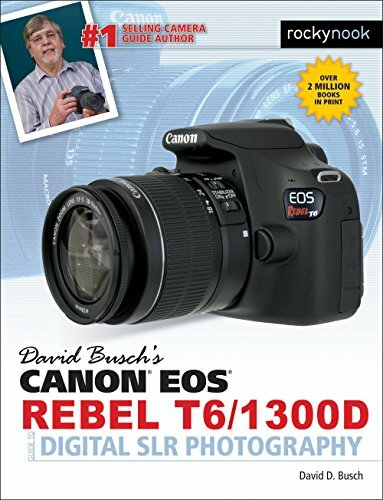 Amazon.com description: Product Description: David Busch's Canon EOS Rebel T6/1300D Guide to Digital SLR Photography is your complete all-in-one comprehensive resource and reference for the Canon EOS Rebel T6/1300D. Aimed at budding photo enthusiasts seeking to improve their photographic skills, the T6/1300D is a budget-priced digital SLR with an impressive range of features, including Wi-Fi communications to link your camera to your iOS or Android smart device. With this book in hand, the camera is remarkably easy to master, too. Equipped with an 18-megapixel sensor, full HD movie-making, an accurate 9-point autofocus system, and a full range of semi-automatic modes, scene options, and creative filters, this newest Rebel has everything you need to explore the world of photography. With clear how-to steps and full-color illustrations, David Busch's Canon EOS Rebel T6/1300D Guide to Digital SLR Photography covers all the camera's capabilities in depth, from taking your first photos through advanced details of setup, exposure, lenses, lighting, and more. Also included is a handy Canon Rebel T6/1300D "roadmap" chapter, an easy-to-use visual guide to the camera's features and controls. With best-selling author and mentor David Busch as your guide, you'll be in full creative control, whether you're shooting on the job, as an advanced hobbyist, or just out for fun. Start building your knowledge and confidence, while bringing your vision to light with the Canon EOS Rebel T6/1300D today. About: David Busch's Canon EOS Rebel T6/1300D Guide to Digital SLR Photography is your complete all-in-one comprehensive resource and reference for the Canon EOS Rebel T6/1300D.